My Grandmother’s Legacy, and my Passion. While unpacking some old boxes, it seemed only fitting that my grandmother’s old granola recipe would appear before me. Carrie Hudson Broers, my grandmother, had always loved to entertain and cook. She appeared before me the moment I found the old piece of paper with her recipe. Just as pictured, her glamorous attire for a casual Sunday dinner tells it all. She ritualized meals to recognize the sacredness of coming together. In finding her granola recipe, I discovered a serendipitous linkage to my grandmother. Her love for bringing people together through cooking, extended all the way to me, and my desire to reach people’s lives through something as simple as granola. So here I stand, two generations later, and decades in-between, with a timeless love for cooking, but better yet, for making granola. 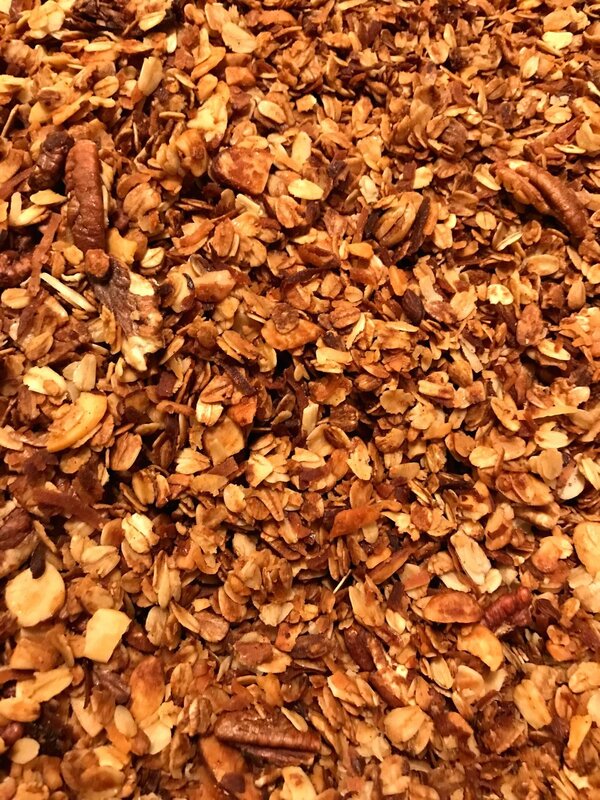 Perhaps there was no irony in finding my her granola recipe, but rather, a tell tale sign that I am right where I need to be, caring on my grandmother’s legacy, and my passion. Say hello to 5 raw ingredients! oats, pecans, coconut, almonds, and local honey- that’s it. What is it that facilitates change? What is it that causes us to alter our views and shift course on the path of life that lies before us? I believe it’s a spark; a spark of clarity where suddenly even big risks seem in reach. Now, of course, everyone finds this spark at a different time, in a different place, and a different experience. For me, that first spark came when I wasn’t even looking for it. I was standing in a subway station in New York City, a young workaholic much devoted to Diet Coke advertising embracing another whirlwind day, when suddenly I was on the ground like a ton of bricks. Turns out drinking a couple of 6 packs of Diet Coke a day doesn’t make you invincible. Anxiety attacks can creep up on all of us, especially` if we don’t take care of our bodies. What we eat directly influences our brains, how we function throughout the day and how we face our challenges. That day the stress won, and I lost. While I recovered and learned the importance of better eating habits, this experience was my first spark; my first sign that it might be time to leave New York behind and start a new chapter in my life. So, I took my big risk, quit my job, and moved to DC to marry my husband Patrick and work in the non-profit sector. From that point on, this new path with my family was meaningful and fulfilling, everything I could ask for. However, while that first spark had come to me out of the blue, this next one I searched for during bleak times. I was diagnosed with breast cancer just before turning fifty. While my family and friends were my safety net throughout giving me critical support, I needed something else: a change, a new challenge, something to make me feel alive again. I began experimenting with nuts, honey, coconut, and foods that were suggested to give a healthy balance (and much needed energy) to my now limited diet. By themselves these ingredients were just miscellaneous foods to mindlessly munch on, but together they tasted savory and sweet; they tasted like hope. This recipe continued from then on to brighten each of my days, however dark they would seem. I began sharing it with family, friends, friends of friends, and then anyone who wanted it. A new sense of purpose was resounding through me as I followed this spark and created my business BQgranola – the silver lining of going through breast cancer. These key events in my life transformed the way I look at healthy eating. I have made many changes in my life, following my instincts and taking risks, like creating this business. I have discovered the importance of balancing family and work (a constant challenge), learning how to keep perspective on the big picture, but also paying attention to the little things. Eating this granola every morning was a little thing, but it made a big impact and was my strongest weapon in maintaining a positive outlook and becoming healthy again. Now it’s a part of my life everyday, so take a chance and let it be part of yours. You may just find a spark.